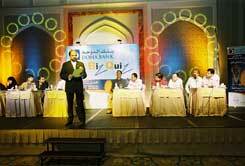 Doha Bank BizQuiz is a periodic country-wide quiz contest open to all business houses in the State of Qatar. BizQuiz 2005 was a general quiz covering various topics. BizQuiz 2005 was a well attended event with 130 corporate teams participating. There was an eclectic mix of Trading companies, Construction firms, Technology outfits, Financial institutions and Banks. 6 Finalists were selected after an intellectually exhausting written preliminary round. The Final was an exhilarating and thoroughly entertaining event with questions from Current Affairs, Finance and Business, Sports , Entertainment and Trivia. Audio clips included archived voices of Neil Armstrong & Bill Clinton and Arabic Instrumental music. The Visual round had a clip from the World War II archives, Finger Wrestling (do a google on it) and some wild life. The last round - RAPID FIRE had 60 Seconds of RAPID FIRE questioning from the Quiz Master-Mr.R Seetharaman. BizQuiz 2005 had a nail-biting finale with margins of 5 points separating the top 3 teams. The discerning audience won quite few instant cash prizes for answering questions posed by the Quiz Master. Expect more such quizzes from QatarQuiz. Here are some photographs and lighter moments of BizQuiz 2005.